The Ideal Vogue C40 Gen2 is a combi gas boiler which is a great choice for properties where space is limited as they do not require an external water tank or cylinder. Everything is contained in one cost effective unit. 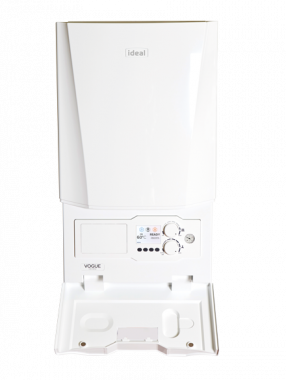 This boiler is a wall mounted condensing unit manufactured by Ideal. It has an efficiency rating of 89.2% making it a B rated boiler and has an output of 40 kW which is perfect for properties with a higher demand for heating and hot water. This unit includes a variety of features and benefits including multi function buttons to help simplify operation, an easy to read pressure gauge, uniform control opening, cool door technology, stylish aesthetics with full size door complete with damped opening, up to 7:1 modulation and a stainless steel heat exchanger. It has been built with only high specification components. This boiler is quick and easy to install with a low lift weight from 30.7kg which is up to 2.6kg lighter than any previous models. It is a single piece unit which enables a quick installation to save you time and money. The backlit 3.5 LCD fully colour display helps to give you maximum control over your boiler. This unit features 8 years warranty so you can be sure you have purchased a highly reliable boiler.